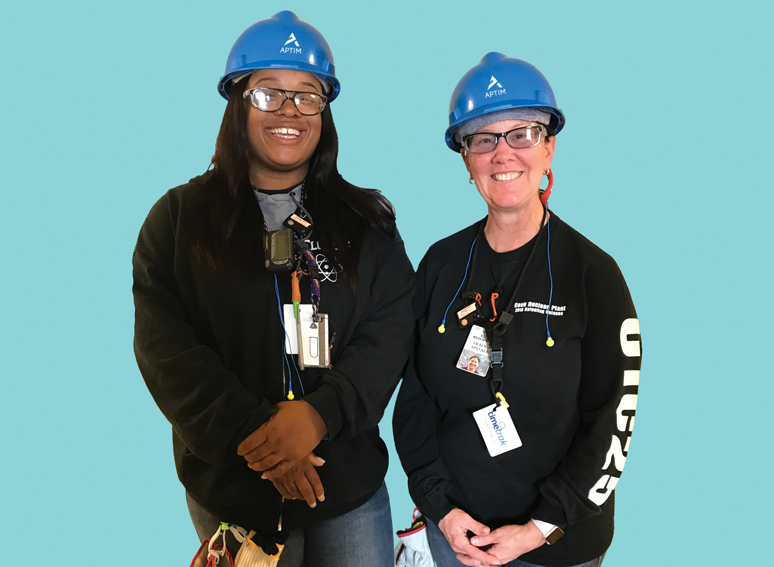 On Thursday, October 24, 2018, APTIM employees Shalonda Flowers and Tracy Spitale were honored for saving the life of a D.C. Cook Nuclear Power Plant coworker. Both women are craft professionals who have been working for APTIM for approximately three years. Since 2016, APTIM employees have been providing maintenance, modification, and supplemental labor services at the plant which is owned by American Electric Power (AEP), and located on the eastern shore of Lake Michigan, about 4 miles north of Bridgman, Michigan. Kelly Ferneau, the plant manager, tearfully thanked Shalonda Flowers and Tracy Spitale for their lifesaving efforts during a presentation held in front of all of their APTIM coworkers who applauded and cheered to show their appreciation. “here’s somebody’s dad or somebody's husband. I wouldn't want someone to just walk past my dad or my brother and do nothing." It all started at about 5:45 a.m. on a typical Wednesday morning. As usual, Shalonda was right on schedule as she worked her way through the plant. Tracy wasn’t far behind her. Shalonda was talking on her phone with her father as she approached the mobile security shed where she observed two individuals standing, and much to her surprise, a pair of legs on the ground, sticking out from around the corner of the shed. Shalonda thought “he is gone” and then as if struck by lightning, “here’s somebody’s dad or somebody’s husband. I wouldn’t want someone to just walk past my dad or my brother and do nothing.” She said to the security guard “I got this” and reached over and ripped open Bob’s shirt to get a better look at his chest. She then placed her hands on the “sweet spot” and started compressions. She put her weight into them, and even though she felt and heard Bob’s ribs cracking, she kept going. She kept up with compressions, as he began gasping for air, only stopping long enough for someone with an AED (automated external defibrillator) to give him a shock. Even after Bob regained consciousness, she continued, only stopping when first responders arrived and took over. Ultimately, the first responders would transport Bob to the hospital where he had bypass surgery to address numerous blockages. While Shalonda never gave up on administering compressions, relentlessly pumping Bob’s heart for him, Tracy never gave up either, comforting and reassuring Bob, and encouraging and praising Shalonda. However, and much to the women’s surprise, the more conscious Bob became, the more difficult it became for both Shalonda and Tracy to continue their efforts, because Bob wanted to get going. His instinct to flee had kicked in and he wanted to get up and get away from whatever was happening to him. He kept trying to get up but the two women leaned into him and kept him down with their knees. Bob was confused and kept asking if he was dreaming. Shalonda and Tracy both kept trying to comfort him, saying anything they thought would calm him. They even told him that they loved him. Tracy stroked his forehead and kept assuring him that he was going to be okay. Finally, they convinced him to stay down, relax, and breath, breath, breath. A few days after Bob’s heart attack, Shalonda went to visit him at the hospital. When he saw her he broke down crying and thanked her for saving his life. She met Bob’s heart surgeon who commented that when he went to operate on Bob he was pleased to see the broken ribs—they were the ribs of a person who survived a heart attack because compressions were administered correctly. When asked about what the most impactful part of the whole string of events was, aside from saving Bob’s life, Shalonda, mom to Kyler age 12, and Tracy, mom to Chris age 32, both agreed that it was the new found respect their sons and coworkers had for them. Also, the pride and sense of peace they feel, knowing that they possess some kind of innate program, that when fueled by a previously unknown inner strength, instinctively kicked in and drove them to step up and take responsibility for saving someone else’s life. © 2019. Aptim Corp. All rights reserved.